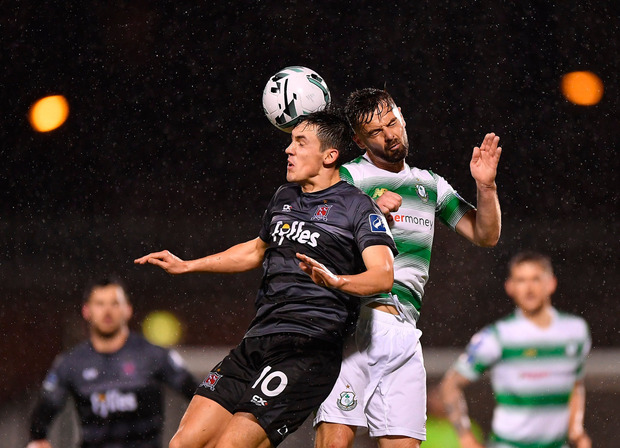 Shamrock Rovers retain the look of a work in progress, whereas a more settled Dundalk team are trying to click into gear. Rovers defended well, with Roberto Lopes sent to right full to shackle Michael Duffy and centre halves Joey O'Brien and Lee Grace doing an effective stopping job. Monday's derby defeat to Bohemians went downhill for the Hoops after a promising opening. Their followers in the crowd of 4,167 must have feared a similar pattern here as they burst out of the blocks quickly only to lose their direction. Dundalk did go up the other end and hit the crossbar through Sean Hoare, but they were sluggish in the opening quarter. Their plans were upset at the last minute when John Mountney sustained an injury in the warm-up, with Daniel Kelly introduced. Rovers had switched Roberto Lopes to right back in an attempt to nullify Michael Duffy and he was reasonably successful. However, Dundalk began to move the ball a little quicker to allow other players come to the fore. Sean Murray and Jamie McGrath became more prominent, while Kelly was a threat on the right side with his direct running setting up an intriguing battle with Hoops left full Trevor Clarke. Rovers boss Bradley had taken Dylan Watts out of the equation to make room for Ronan Finn but his midfield lacked real control of proceedings. Jack Byrne started as a narrow left winger but drifted infield as the half progressed. As the interval approached, Rovers were under the cosh. Kelly fizzed one effort wide after a set piece broke down before Hoban steered a Duffy cross over the bar. The natives needed the half-time whistle to regroup. But the picture didn't improve dramatically and Bradley withdrew the unimpressive Vojic before the hour mark in an attempt to give Rovers a presence up front. The ball was coming back far too easily. Carr made an impact and was involved in the build-up to a Rovers penalty shout when Ronan Finn's cross was blocked behind by Hoare. Rovers protested that he had used his arm. Indeed, a game that has spilled over in recent years was surprisingly cordial as it ticked towards full-time. Last year's player of the season Duffy kept trying to push open gaps for Dundalk, but there were a couple of hooped shirts tracking his every run. By the end, both parties seemed to have accepted the inevitability of the outcome and it was all relatively civil when Paul McLaughlin blew up. Expect more of a spark as the season progresses.